When the Nokia 5800 XpressMusic was released a little more than a year ago, we thoroughly panned it in our review -- put simply, it felt undercooked and uncompetitive in a world where webOS, iPhone OS, and Android were all realities, regardless of Nokia's existing smartphone dominance through much of the world. More than a year later, we're now presented with the Nokia Nuron, a pretty close relative of that first S60 5th Edition device from back in the day; it's simply a carrier-branded version of the 5230, which itself is a lower-end variant of the 5800. Despite its flaws, the 5800 has gone on to become a global success for Nokia -- but can the Nuron do the same in a market traditionally unfazed by Nokia's advances? More directly, has Nokia's first volley in the modern touchphone battle evolved enough to become a prime-time player in the States? Let's find out. As you might be able to gather from its family tree, the Nuron is a dead ringer for the 5230 and for the 5800 before it -- it's the same physical layout (and made from the same materials) all the way around, and the white / silver color scheme that T-Mobile has chosen for its version might be our favorite of the lot. 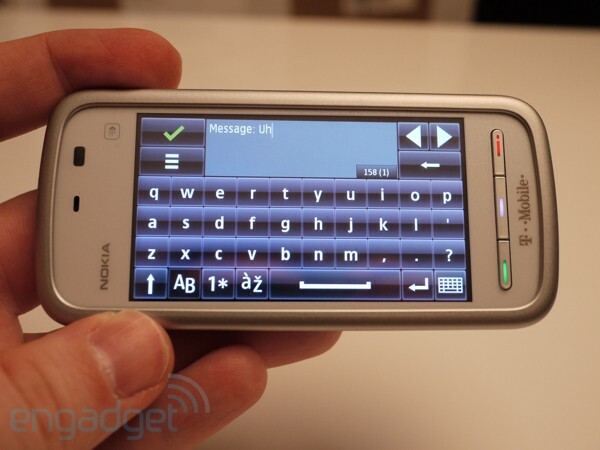 Along the right side you've got a one-position camera button (there's no autofocus to worry about), a volume rocker, and the lock / unlock slider familiar to those who've used the 5800, N900, or a number of other Nokia products. On the left you'll find two slots protected by flaps -- one for the microSD card, another for the SIM; getting the SIM in is a simple matter, while getting it out again requires just a little more effort since you've got to remove the battery and use a pen or similarly-shaped object to pop it back out through a slot in the circuit board, but it shouldn't be a big deal unless you do a ton of SIM swapping. Along the top you've got a power button that calls up the typical profile menu when pressed, a 3.5mm headphone jack, a micro-USB port protected by a flap, and -- get this -- an old-school 2mm power jack. Why's it there, you ask? Because the Nuron doesn't charge over micro-USB, which is positively unheard of by 2010 standards, even in Nokia's own product pipeline. The only possible explanation is that the Nuron's based on 18 month-old hardware, but that doesn't make it acceptable. 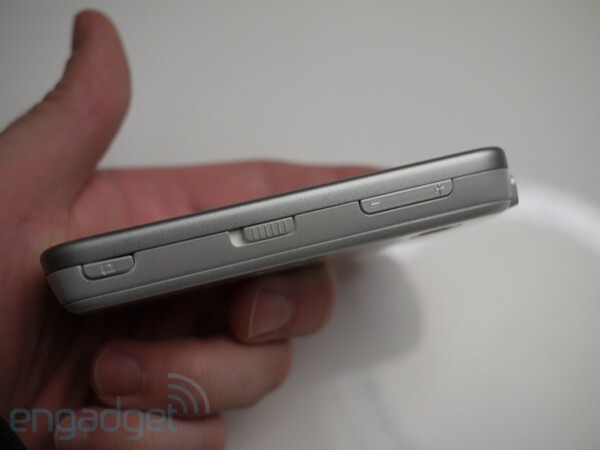 The volume rocker is deceiving, particularly for those not used to Nokia's quirky way of handling things. Basically, it does absolutely nothing most of the time, because it isn't used for adjusting ringer volume -- for that, you've got to muck around with your profile (to be fair, Nokia does a far better job supporting profiles than most manufacturers, but it still takes a little more effort than we'd like). Instead, the rocker only comes into play when you're in a call or listening to music, or intermittently as a zoom control for some applications -- though we couldn't figure out a rhyme or reason to how or where Nokia decided to implement it (it doesn't work in the browser, for example). On the left side, you'll also find a small hole toward the bottom. This is the lanyard port, an accessory that plays a slightly more important role on the Nuron than on most phones because -- like the 5800 -- it's provided with a plectrum in the box. As a refresher, "plectrum" is the uncool dictionary term for a guitar pick, and "uncool" is exactly how we'd describe Nokia's expectation that anyone would want to carry this thing on a string hanging off the corner of their phone. How necessary is the plectrum, exactly? Fortunately, we found that the resistive display pared with the latest incarnation of S60 5th Edition here does a relatively good job of keeping our fat fingers happy, and for those very rare occasions where we need more precision, we can just turn our finger around and use our fingernail temporarily. Disaster averted, no plectrum necessary -- but seriously, if Nokia really thought you'd need a tool like this, they would've been well-served to find a way to slip a stylus into the case (something better than the 5800's afterthought of a stylus built into the battery cover, that is). We're sure there's room. We know there'd be room for a stylus because something very, very important was left out of the Nuron: WiFi. To leave out WiFi from a smartphone these days and charge $70 for it on contract is almost insulting, and it's particularly egregious when you're launching the device on the carrier with the smallest 3G footprint of the Big Four. 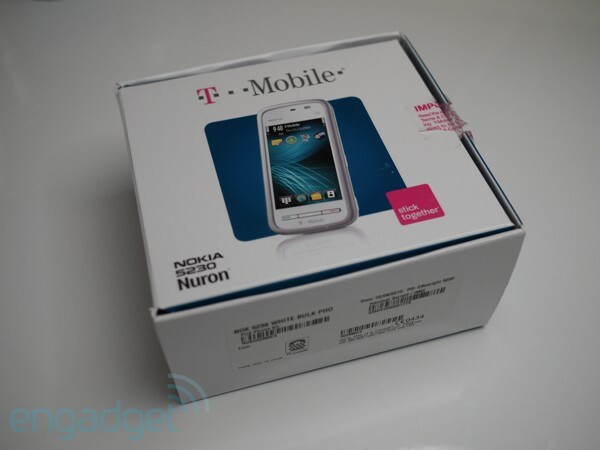 Of course, we've got to let T-Mobile take part of the blame on this one -- they (and their customers) would've been well-served to ask Nokia for a branded version of the WiFi-equipped 5800 rather than the 5230, which in turn would've made us a wee bit more comfortable with the sticker price. As it stands, though, this is an extremely difficult device to recommend if you're outside of T-Mobile's 3G coverage area. As for software, S60 5th hasn't evolved much from its humble roots -- you certainly won't find anything akin to Symbian^4 here. Many of our complaints from the 5800 carry over, like the mixed item-selection paradigm (one tap on the main menu, two taps in lists) and the weak text entry, but the addition of inertial scrolling makes a surprisingly big difference in everyday usability. The way we'd describe it is this: current dumbphone users, S60 5th Edition users, and most S60 3rd Edition users will feel right at home with the Nuron's user experience, but everyone else -- particularly anyone who's used a Pre, iPhone, or Android device -- will be a bit stymied by some of the platform's stranger principles. The phone offers up essentially the same tried-and-true WebKit-based champion of a browser that Nokia has been using on its smartphone for years, which does a fabulous job of rendering most sites designed for desktops; finger scrolling and automatic orientation changes both work well, too, but we found that the phone tended to choke up on more complex sites (Engadget is an unfortunate example). In general, the phone felt a little underpowered for some of the tasks it was being asked to perform; the "bounce" effect at the ends of lists during inertial scrolls was a little jerky, for example, and even simple tasks like pausing music were met with momentary delays -- nothing more than a fraction of a second, but perceptible nonetheless. The big deal about the Nuron -- the 800-pound gorilla on the spec sheet, if you will -- is the fact that it includes Ovi Maps with turn-by-turn capability for free out of the box, making it one of the cheapest phones to ship anywhere with usable in-car navigation at no additional charge. We've already shown that Ovi shakes out as a pretty good solution when you put it up against the competition, and the Nuron is no exception -- but the phone shares the same weakness that we've seen on countless Nokias (and BlackBerrys) of the past: it's pretty hard to get a location lock. Anyone with an Android device or an iPhone of any generation knows that they can hop into their mapping app and get a rough location fix almost immediately, but even with AGPS fully enabled on the Nuron, we waited for several minutes by a window with downtown Washington, DC showing on the display (we're in Chicago) before giving up. In 1965, a man by the name of Ralph Nader published a book entitled Unsafe at Any Speed, an exposé of the American auto industry that detailed extreme safety shortcomings of cars manufactured at the time. What the heck does that have to do with the Nuron? Well, bear with us for a moment. The 5230 is a phone that sells internationally for €149 unsubsidized, unlocked, and unbranded. That's just $200! The Nuron, by contrast, is locked and branded, which immediately devalues the phone by a somewhat unquantifiable amount -- but regardless of the dollar figure you want to put on that, it's worth something less than $200. T-Mobile meanwhile charges you $70 to own this phone on top of a two-year contract with a $200 early-termination fee. Translated, that means that if you buy this phone, break your contract, and keep the phone, you're out $270. Coincidentally, we kept thinking to ourselves "this might be a decent phone if it were free on contract" as we played with it. But it's not free, and it's certainly not worth a dime more than that. In other words, it's -- drum roll, please -- Unrecommendable at Any Price. Here's another way of looking at it. In the context of T-Mobile's smartphone lineup, you've got the WinMo-based Dash 3G at $50, the G1 at $100, and the CLIQ XT at $130; realistically, we might expect to see the G1 fall in price one more time before it's discontinued. The Dash 3G's WinMo roots and lack of a touchscreen make it a tough call, but we wouldn't hesitate to recommend a G1 over the Nuron; like the G1, Nokia's latest entry certainly isn't going to win any beauty or thickness contests, and the G1 is arguably a significantly more capable device out of the box. Yes, free turn-by-turn is the Nuron's ace in the hole -- but when you've got this many negatives stacked up against you, it's just not enough, especially when you consider that Google Maps Navigation is on Android 1.6 anyhow. If there's a positive we can take from this, it's that Nokia and T-Mobile are starting to work a lot more closely together than they have in the past; the Nuron is evidence of that, of course, and the N900's AWS support is a telling sign, too. With MeeGo in the pipe and Symbian chugging along, we're excited to see what these guys do together in the future, but for now, the Nuron -- which hits stores this Wednesday -- is unfortunately a strong avoid.